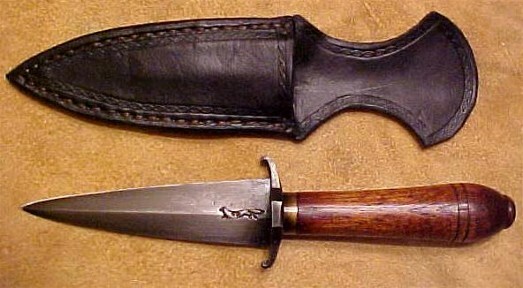 SWAMP FOX KNIVES strives to bring you historically accurate hand forged knife reproductions. They are made in the manner and likeness of knives used during the formative years of the United States.They look like original knives because they are crafted like the originals...hand forged with hammer and anvil. My knives are representative of the period 1730 -1880,are researched to be historically correct and offer a unique touch of the past for reenactors, living historians, hunters and collectors. I use 1080/1084, 1095, 5160 steel and occasionally antique files. I have several knives and camp ware reproductions in movies and museums. The Alamo Movie (version with Billy Bob Thornton- Many eastern style hunting bags. The Conspirator Movie- All Conspirator pieces were researched with two pieces made from specific details provided by the Ford's Theater museum. The etching was done by my brother-in-law, Jon Moran. One of the knives was published in USA Today (April 27, 2010) in a "released scene" photo that can be seen by an internet search The Conspirator knife pictures are below. My running fox stamp is hidden beneath the handles so as not to compromise the integrity of the reproduction in the movie. 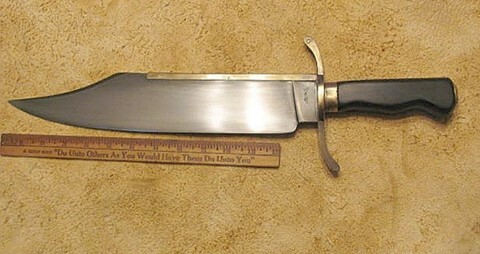 Journey 2: Mysterious Island Movie- This had 3 machetes with carved handles for a Jules Verne-based movie, Mysterious Island. Specifics for the machetes were researched and sent to me by the studio Properties Master.